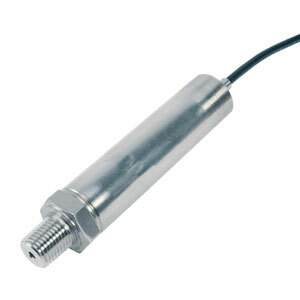 Click on this link if you need more information about Pressure Transducer or how we can customize your Pressure Sensor. New USBH Product Release With Upgraded High-Speed Software! OMEGA is excited to announce the release of a major software update for our USB transducers! The fresh look and added features offer even more value and flexibility to your OMEGA® transducer purchase. Charting Window – The addition of a charting window allows you to see your data graphed in real time. The Y axis is configurable to allow simultaneous graphing of multiple engineering units. You can output the image of your data to a png file. Channels Window - Display data from all of your sensors simultaneously. Each channel has configurable user alarms, three data filters, tare, resettable low/high indication, and sample rates ranging from 30 minutes to 1000Hz. Logging Window – A new xls filetype output option presents pre-formatted data for readability. 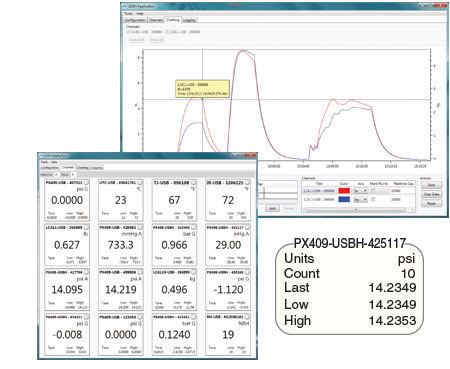 In addition, Live Statistics are displayed, including the sensor information, the start/stop time, the number of samples taken, the current reading, and the High/Low readings. With the logging window, you can capture your data for later analysis. The PX409 High Speed USBH Series connects directly to your computer. Free software makes data logging and charting your readings a simple task. Also included are .NET drivers and a command set for command line access. The micro-machined silicon design are ideal for pressure or level applications in laboratory, test platforms, or bio/pharmaceutical applications as well as industrial applications that require a rugged, high accuracy transducer. The micro-machined silicon sensor provides a very stable transducer with exceptional high accuracy of ±0.08% and a broad compensated range of -29 to 85°C (-20 to 185°F). The modular construction allows for fast delivery of most configurations and fittings. Span Setting: ±0.5% full scale typical ±1% maximum (±1% typical, ±2% maximum for 2.5 psi and below). Nota: Comes complete with 5-point NIST traceable calibration certificate, free download digital readout and logging software, .NET drivers and command set.